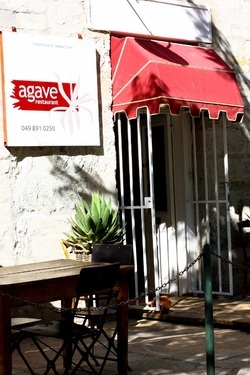 Agave is an oasis of calm in the heart of the Karoo where creative Karoo cuisine emerges from a classical French background. Influenced by the stylish country inns of Provence and Tuscany its unique interior create a warmth and intimacy enjoyed by both business and private parties alike. Agave is the perfect setting for every occasion and all sorts of events. The combination of exquisite food and award-winning wine impeccably served in such a unique setting guarantees a memorable dining experience. The tea garden has a fully grown grape vine creating a bright and airy dining space, particularly lovely during the Spring and Summer seasons. Transformed at night by candles, starlight and a crackling fire during the winter months, you may agree this is one of the most romantic restaurants in Graaff Reinet. An exceptionally romantic atmosphere with an unusual combination of picture frames, fabric panels, fireplaces, coffee kettles and a grape vine makes this gem in the heart of Graaff Reinet suitable for marriage proposals and other special occasions, equally magical is the fine “French Karoo” cuisine, supported by superb service.